The idea was a way to show people the best food in Japan beyond sushi — to literally show them, in picture form. Then the thought morphed into writing to a book, where the best food in the world was shown. But that’s a lot of travel for one person. So the thought became, why not crowdsource it? That’s Foodspotting. Foodspotting is an application that allows you to take picture of a food, say what it is, and pin it (with geolocation) to the restaurant where you got it. You may wonder who would use such an app — but just think for a second about how many of your friends on Twitter tweet out pictures of food. People have been doing this long before Foodspotting, this app just gives them more of an incentive to do so, and let’s them organize it. It’s also one hell of a new food discovery tool. And that’s exactly why the team behind it, Alexa Andrzejewski and Ted Grubb, hustled to get the official iPhone app done in time for the SXSW festival, which starts next week in Austin, Texas. 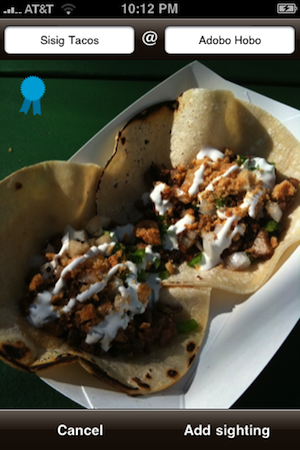 With it, you’ll be able to use the “Guides” to easily find (and contribute to) the best foods in Austin. The Foodspotting team put together a few of these guides (including a scavenger hunt, and a street food one), but other users have already created others as well. From these guides, you can easily mark which foods you “want” to bookmark them for later. You can also note which foods you’ve already eaten (“nommed”). 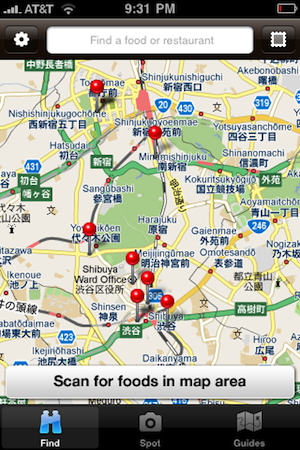 Of course, you can also use the app to search for a particular food or restaurant. Or simply scroll through the pictures on the main screen to see a stream of food (which can be sorted by “latest,” “nearest,” “best,” etc). And yes, you can use a map view to see the food too. When you yourself spot a food, you can tweet it out to your followers. Or, thanks to Foursquare’s relatively new API, you can also check-in to a venue simply by foodspotting (yes, the service hopes the name becomes a common verb). It’s one of the most interesting location-based plays that will be on display at SXSW — a conference that will be rife with location-based services. 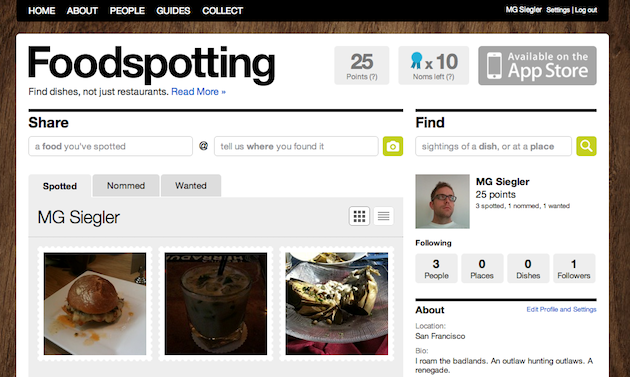 But Foodspotting is a bit different because they’re not aiming to be a location platform like Foursquare or Gowalla. Instead, they’re happy to use location to augment their own reality-based game. That is, after all, essentially what Foodspotting is. Just like with the other two aforementioned location services, you earn some badges for tagging certain types of foods in pictures (they called them “Expert Badges”). And you earn others for participating in the Guides. And, of course, there are points for doing all of this. While the “lite” version of the app has been available in the App Store for a few months, the team has done little to promote it, waiting instead until the full version, which launches today in the App Store. Still, the lite version (and the very nice-looking website) proved that there’s a demand for this service. 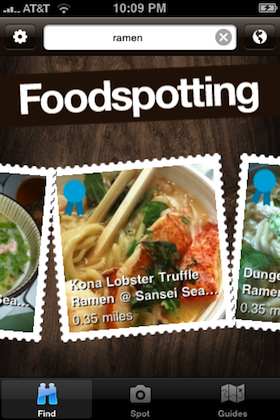 Already, Foodspotting has seen over 15,000 foodspottings. Top cities include San Francisco, New York, and Honolulu. So how do you make money off of this idea? That’s a question the Foodspotting team has had to answer a lot recently, as they’re currently in the process of raising a seed round of funding. The natural idea is to become popular enough that restaurants and brands want to partner with the service to promote themselves. “It’s kind of like pumping a scent out of your bakery window to draw people in,” Andrzejewski says. Already, the service is teaming up with 7×7, an insider’s guide to food in San Francisco to show how a partnership could work (it’s a non-paid partnership, for now). The iPhone app, created for Foodspotting by EGG HAUS, Inc, is available today in the App Store for free. Find it here. Eventually, the plan is to expand to the other mobile platforms as well.